Here they are, so cute, aren't they? 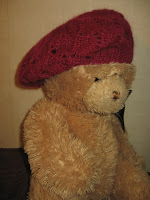 I've knitted a baby cap earlier, and this lucky baby is going to have it too! 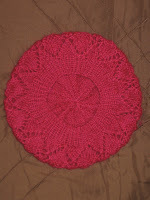 And the cap is made of the same yarn, and the same SKEIN, so altogether this project consumed under 50 g of yarn. Wow! And, I think I even have enough yarn! Yippee! Oh my gosh, look at these! 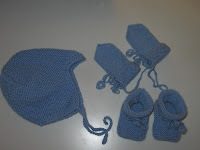 I promised my god-mother to knit these teeny weeny footies for her friend's baby boy. This is the first one, and look how small it is! So cute! MERRY CHRISTMAS TO ALL MY VISITORS! This Christmas was the last one I spent at home. Of course I'm going to visit my parents every Christmas, but as a guest... I'm not feeling sad yet, but it'll be a big change to live with Jussi all year round instead of living with my parents. After all, I've been living home for almost 19 years already! My mother-in-law-to-be has a very small head, so I used a little bit smaller needles. I actually read the Little Prince in one day. Gosh I love it! And. 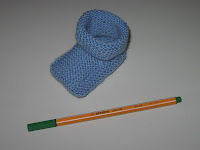 What have I knitted? 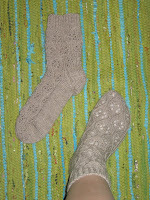 I've making these yellow-gray -striped footies for my premier bridesmaid. 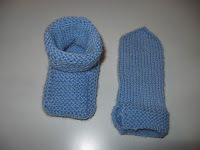 Aaaaaand... Oh, the Paradoxical mittens! One down, one to go. They are here! Wow! It didn't take long, did it? 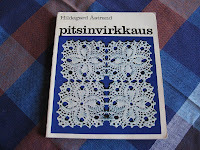 As I told you before, I bought a lace crocheting book (Hildegard Åstrand's Pitsinvirkkaus). 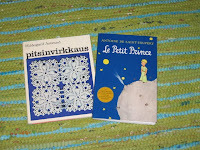 And, I bought The Little Prince, written in French! So the name of the book is actually Le Petit Prince. I really like this one! Antoine de Saint-Exupéry was a genious..! Absolument magnifique, ce livre! Peut-être le meilleur livre français que j'ai lu! J'adore cette naïve façon d'écrir, de raconter une histoire, un conte! Comme nous n'avions jamais vieilli... Comme tout le monde, le monde éntier était dans ce livre. Je l'adore. What to do buy for my Dad? Finally. The last period of finnish senior high school (or lukio here in Finland) started today. AMAZING. 13 periods altogether, almost three years... Wow. 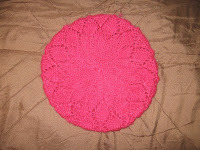 I don't have that much courses anymore = more time to knit. :) Though, matriculation exams are coming again, I'm a little nervous, but not too much, yet. So. 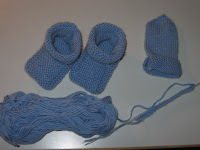 I continued knitting the Paradoxical mittens for Jussi. I'm not quite sure if they are big enough... Well see. Oh, and guess what I bought.